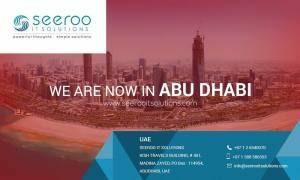 We are highly delighted to announce that SEEROO has expanded our presence in the Middle East and that we have a fully functional office in Abu Dhabi, United Arab Emirates from Jan 2017 onward. We are making our first official entry into the middle east arena to continue providing what we do best to the software solutions industry: "Powerful thoughts, Simple solutions". Our new office should help our clients interact with us directly and enjoy quick and faster support and responses while our existing associates and partners can work together in a better way. Our office in Abu Dhabi is the front door to our entire services and solutions and clients from entire Asia, Europe and America can enjoy our direct support. The main focus of our middle east entity will be in continuously providing consultancy services. Reaching more SME with our ERP solutions is another key service we can offer. We also provide Digital Marketing, Branding, E-commerce Solutions and Mobile Applications (Android and IOS). Najid Pasha, our CEO, will lead the middle east operations with the support from a selected team of professionals who have got vast experience in different areas of software services. The team will be supported by our office in India to provide solutions at a quick pace.